From Kings To The Average Joe: Gout Makes A Comeback : Shots - Health News Researchers have found that gout, a painful ailment of the joints, increased 44 percent between 1988 and 2008. They suspect it has a lot to do with the obesity epidemic and related health problems like diabetes, high blood pressure and high cholesterol. King Henry VIII famously suffered from gout. An image of gout is easy to conjure up: The portly, elder royal resting his foot on a pillow, with a swollen, red and extremely painful big toe. 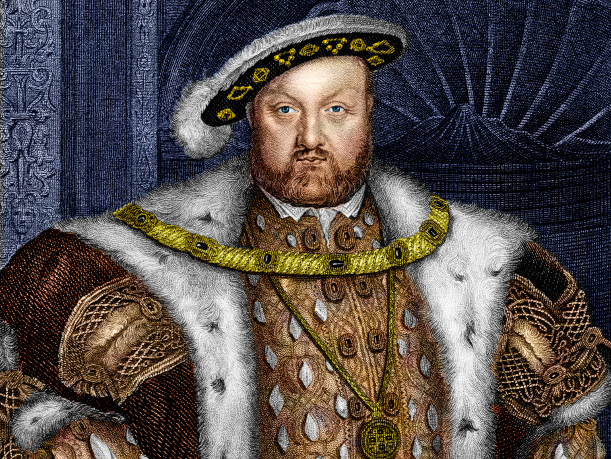 It could be Henry VIII, who was afflicted with the "disease of kings." But today gout seems to be the disease of the average middle-aged American who's pudgy, consuming too much meat and drinking too much alcohol — not unlike what the royals used to do. Researchers from Boston University School of Medicine looked at federal health surveys to compare rates of gout in 1988-1994 to 2007-2008 and found the disease had increased 44 percent over those two decades. They suspect it has a lot to do with the obesity epidemic and related health problems like diabetes, high blood pressure and high cholesterol. Their study was published online this week in the journal Arthritis & Rheumatism. Gout is an extremely painful type of arthritis that strikes without warning and causes extreme swelling, inflammation and pain in the joints, mostly in the feet. Too much uric acid is what causes it. Dr. Hyon Choi, professor of medicine in rheumatology and epidemiology who headed the study, found rates of elevated uric acid levels rising over time. He says one in five Americans have elevated levels of uric acid. The excess uric acid can cluster and form into crystals, sort of like like sharp microscopic needles. They migrate to joints in the feet, knees, elbows and even shoulders causing intense inflammation and pain, says Choi, that's "excruciating." There are a number of reasons for too much uric acid. A big one is genetics. Being male also makes you more vulnerable. And the older you are, the greater the risk. But diet is also a factor. And that is where extra weight and obesity come in. Uric acid is a chemical byproduct of metabolizing high fat and high sugar foods, as well as alcohol. When Choi closely analyzed the data, he found a strong link between increases in the number of gout cases and the simultaneous rise in obesity and hypertension. Fortunately, gout is simply and effectively treated with anti-inflammatory medication. And once treated, the best approach by far, says Choi, is to prevent the problem in the first place by eating healthfully and cutting down on alcohol, particularly beer, which can raise uric acid levels. For more images of gout, you can check out these vintage medical ads, courtesy of NPR's Picture Show blog.